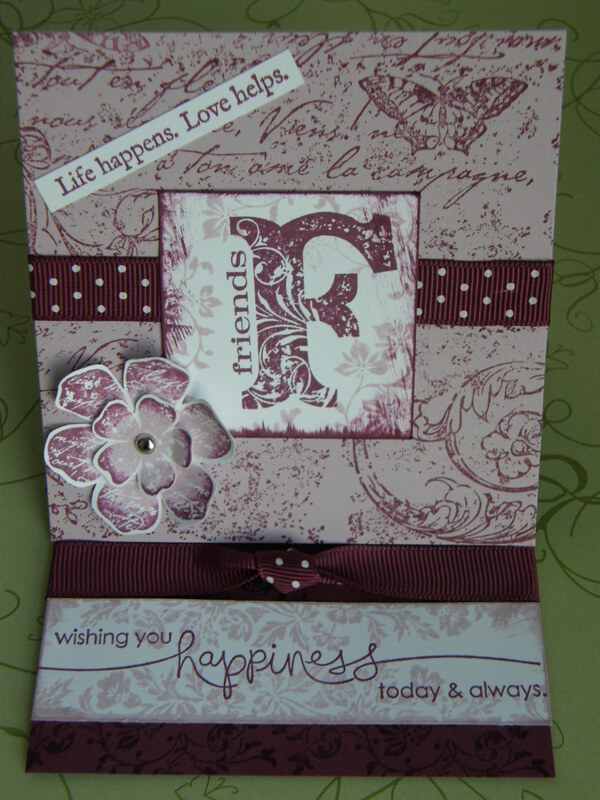 Cardstock: Pear Pizzazz, Real Red, Whisper white. Ink: Real Red, Pear Pizzazz. 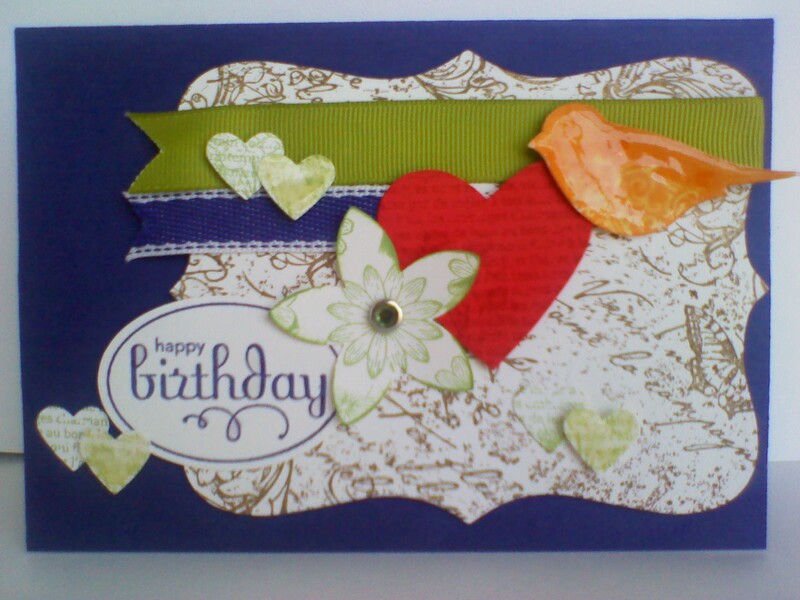 Big shot, Houndstooth embossing folder, Two tags die, Fun Flowers die, Buttons Sizzlit no.5 die. Pear Pizzazz Seam binding Ribbon, Ice circle Rhinestone Brad, DSP: Pocketful of Posies. Sponge, twine, Word-window punch and Corner Punch. 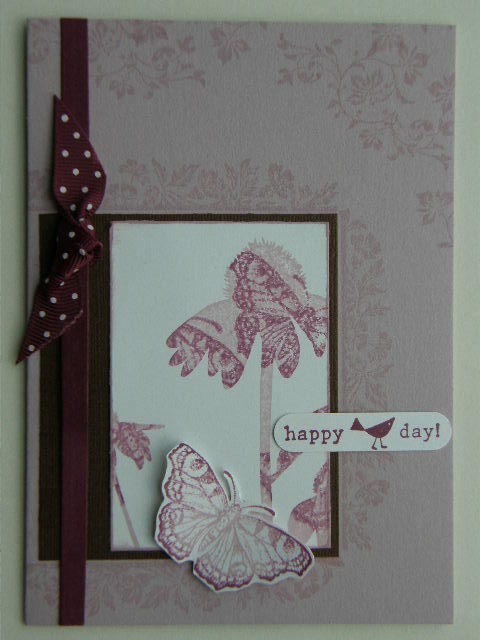 Stampsets: You’re a gem, All A Flutter, French Foliage. 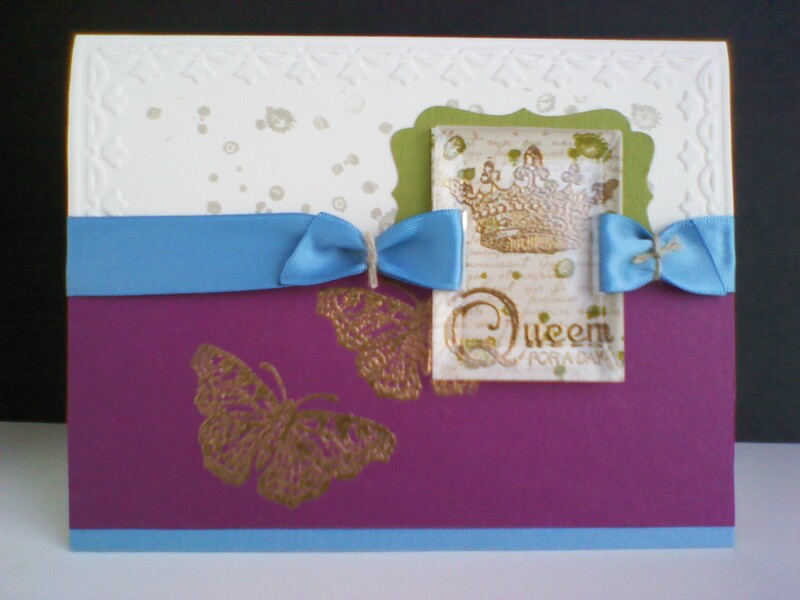 Cardstock: Very Vanilla, Rich Razzleberry, Marina Mist, Old Olive. Ink: Versamark, Sahara sand, Old Olive. Tools: Big shot, Framed tulips EF, Bevelled window panes, satin ribbon: Marina Mist, gold embossing pwdr, Decorative label punch, linen thread. Stampset: Punch Potpouri, Perfect Punches, Very Vintage wheel. Ink: Concord crush, Pear Pizazz, Peach Parfait, Poppy Parade, Soft Suede. Accessories: Poly stitched ribbon (Concord crush), Grosgrain (Old Olive), Dimensionals. Crystal effects, Rhinestone brad, Small Heart punch, Five petal punch, two step bird punch, Wide oval punch, Big shot and top note die. Stampset: Artistic Etchings, En francais background. Tools and Accessories: Big shot, Vintage wallpaper embossing folder, Top note die, Early expresso striped grosgrain ribbon, brad, dimensionals, 12 month calendar and pen. Cardstock: Melon Mambo, Rich Razzleberry, whisper white. 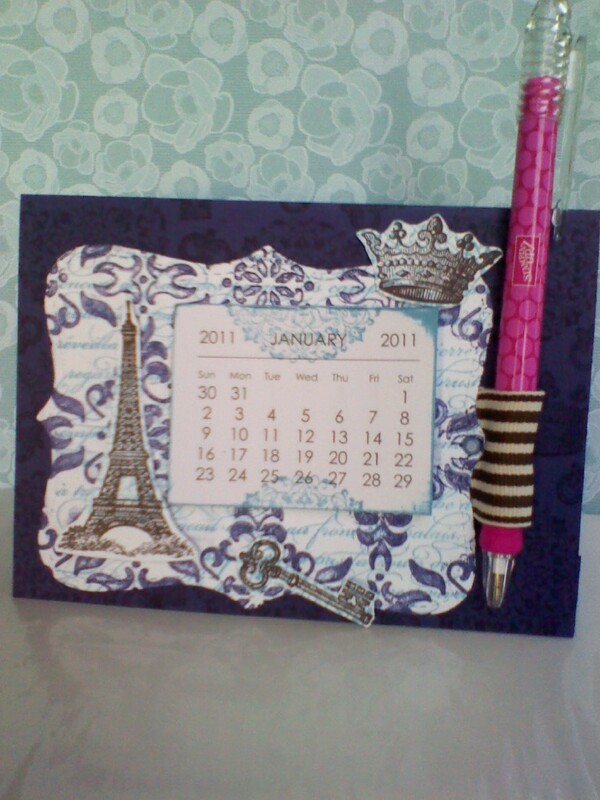 Accessories: white signo gel pen, Ice circle rhinestone brad, distressing tool from cutter kit. 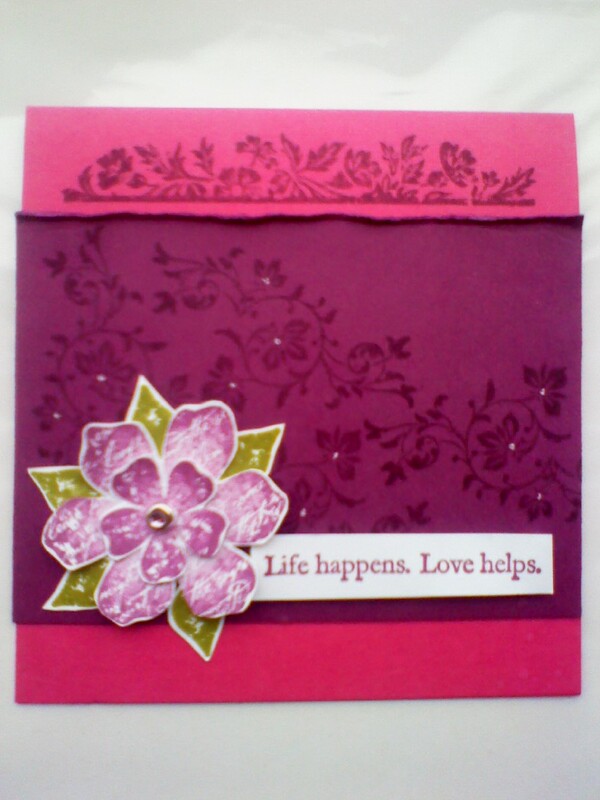 Stampsets: Medallion, Teeny Tiny Sentiments, Tiny tags. Ink: Rich Razzleberry, Baja breeze, Not quite Navy. 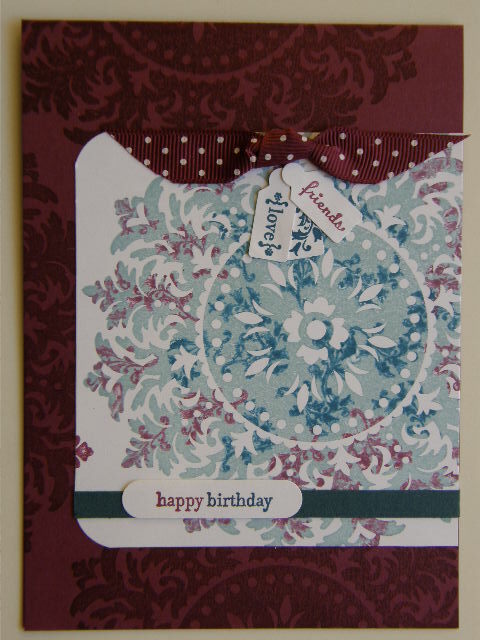 Cardstock: Rich razzleberry, whisper white, Not quite navy. Accessories: Polka dot ribbon (Razzleberry), Medium Jewellery Punch, Word window punch, Corner rounder. Stampsets: Vintage Vogue, Very Vintage wheel, From the Heart. Cardstock: Rich Razzleberry, Pale Plum, Whisper white. Ink: Rich Razzleberry, Pale plum. Accessories: Rich Razzleberry polka dot ribbon, silver brad. 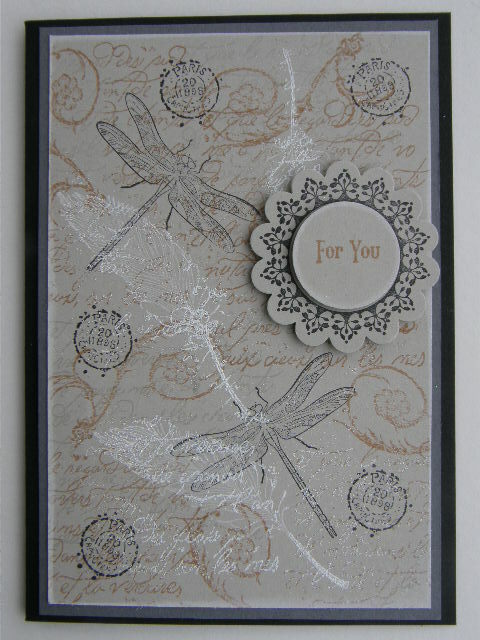 Cardstock: Sahara Sand, Basic Grey, Basic Black. Ink: Black Stazon, Whisper white craft, Creamy Caramel. 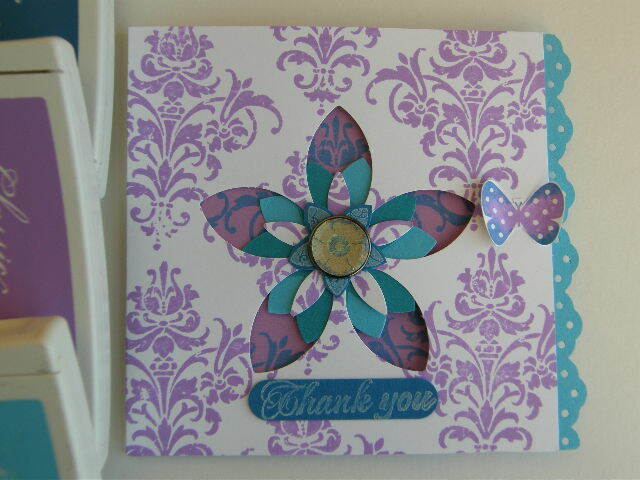 Other: white embossing powder and heat tool, Scallop circle punch, 1″ circle punch, dimensionals.